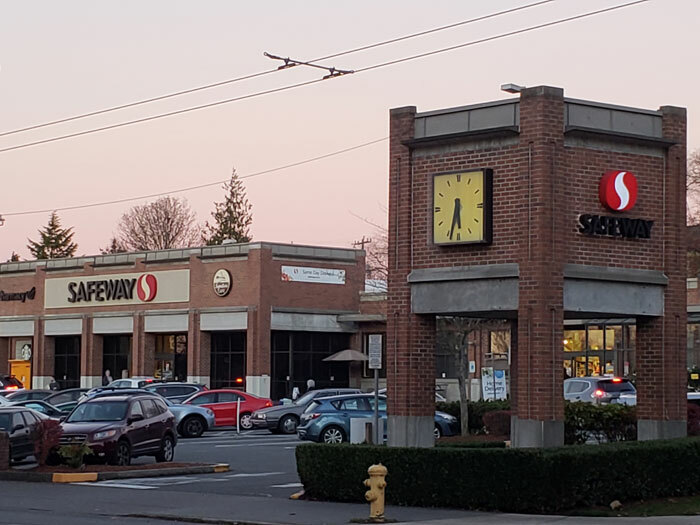 Photo by Brandon Macz: Plans to demolish the Queen Anne Safeway and build one double the size, and with hundreds of apartment units on top, are being refreshed with new developer barrientosRyan assigned to the project. The Queen Anne Community Council’s Land Use Review Committee will hear a presentation from the design team with barrientosRyan about plans for redeveloping the neighborhood Safeway during its meeting at 7 p.m. Monday, Dec. 17, in Room 3 of the Queen Anne Community Center, 1901 First Ave. W.
Plans to redevelop the Queen Anne Safeway, doubling its size and adding apartments on top, are back on track after the company tapped local developer barrientosRyan to take over the project. Safeway cancelled its original redevelopment plans earlier this year, which had been to level the existing building at 2100 Queen Anne Ave. N. and construct a 50,000-square-foot grocery store, with roughly 250 housing units above and two levels of underground parking with 154 commercial stalls and 175 residential. Architecture firm Ankrom Moisan had been attached to the project when it went before the West Design Review Board last November, as was Holland Partner Group as the developer. The board directed the design team at that time to come up with a concept that wasn’t so focused on the grocery store element, and couldn’t decide which of the three proposed building massings worked best. “Having the luxury of being able to see what the comments are is extremely helpful,” said barrientosRyan partner Maria Barrientos of the past design proposal. And the comments are expected to keep coming, with plans to do a significant amount of public outreach for this new iteration of the project, which will still include a 50,000-square-foot Safeway. Barrientos said there is the potential for 250-280 housing units to be built on top, which will likely be a mix of one- and two-bedrooms. She said they are also looking at three-bedroom units, and whether that should simply be three rooms or two bedrooms and a den. The project likely won’t go before the West Design Review Board for a new Early Design Guidance for another four months, she said. This will be the ninth project for barrientosRyan in the Queen Anne and Uptown areas of Seattle, and Barrientos said Safeway wanted a developer who would be thoughtful and sensitive to the needs of the neighborhood. Albertsons Cos., which owns Safeway, has been developing new urban concept stores, and the Queen Anne site will follow that model. “They have been rolling out some new concept stores that just are way bigger, that have a lot more amenities and products and experiences that people want,” Barrientos said. She said a concept design for the whole Queen Anne project is still being worked out, but plans are to break up the massing by possibly spreading the multifamily housing component across two or three buildings on top of Safeway, with room for a podium deck with green space and rooftop decks for residents. “I don’t think there’s enough space on the site to have additional retail,” Barrientos said. The expectation is that community outreach will start sometime in December, and will likely include gathering feedback from the Queen Anne Community Council's Land Use and Planning Committee (LURC) at its next meeting.